In France when Grace and I were there, it was strawberry season. At the market in Lyon, I could barely choose from three or four different kinds, and eventually settled on a container of tiny fraise du bois, which smell like those sparkly red strawberry marshmallows from the penny candy bin and taste like the concentrated musk of spring, like dew and flower petals and the nectar sucked off clover tips, and like deep, dirty red – if a colour can have a taste, those thumbnail-sized ruddy berries were vermillion. Before we left, Grace plotted out the best places for us to eat, and I nodded happily along as she prattled off the names of places we would go to in the France that belongs to David Lebovitz, Dorie Greenspan, and Clotilde Dusoulier. We followed them all over Paris and Lyon to markets and bistros and crêperies, devouring as much as we could. The best place for strawberries was a restaurant called Spring. It’s an expensive little restaurant, and Grace made a reservation online before we left and then never heard back from them, and she worried that we would not have a table for lunch. She attempted to confirm the reservation, in French, which proved inconclusive. We decided to meet there at the scheduled hour after wandering separately in the morning as we had disparate destinations (mine involved the purchase of seeds to one day grow fraise du bois of my own), and though my inability to read a map pulled me the opposite direction a long way down Rue de Rivoli, we were both able to make it in time. At Spring we had a perfect meal – cool tuna belly with chilled asparagus, sorrel, and tonnato sauce; cold white wine; crisp fried anchovies; masterfully seared filet of acorn-fed, bushy-banged black pork with grilled wild fennel; five cheeses, tiny bites but more than enough to know everything important about – or at least to imagine in detail – five different terroirs; chocolate sorbet with cocoa nibs and white pepper; pistachio cream stuffed between two homemade chocolate wafers. 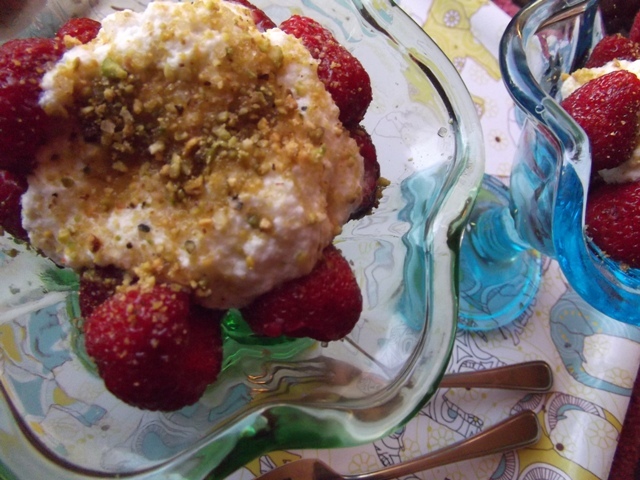 And strawberries, orangey red and topped with a dome of sweetened crème fraîche and dusted with ground pistachios and sugar. They could have served it in a bucket and I still wouldn’t have had enough, and I’ve been dreaming of those berries ever since. When we returned to Vancouver, almost nothing was in season yet. I’d have to wait a month, at least, for the first berries of summer. More than six weeks have passed since we’ve been back, and finally this past weekend I got my fix. Tracy and I made a date and drove to Westham Island, to Bissett Farms, and picked as many strawberries we could in one afternoon. It’s been chilly for an unseasonably long time on the coast, so the berries are more tart than I was expecting. This year you may want to sweeten your crème fraîche more than you might otherwise. To recreate my dish, select as many small strawberries as you can fit into four handfuls. Wash and hull the berries, and put them into four ramekins or parfait cups. Stack them jauntily. This is important. Sweeten one cup of crème fraîche with one to two tablespoons of honey and a drop of orange flower water, if you’ve got it. Grind freshly roasted pistachios, about 1/3 cup, with a heaping tablespoon of sugar in a food processor. 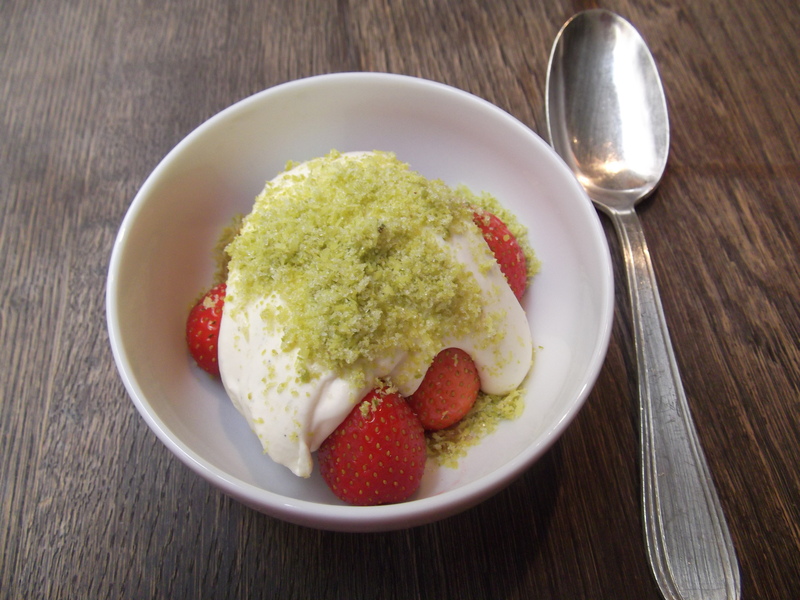 Spoon crème fraîche over strawberries, then sprinkle each serving with as much pistachio sugar as you feel like. Imagine Paris. Next > Zucchini parmigiana sandwiches. Your descriptions are moutherwatering! 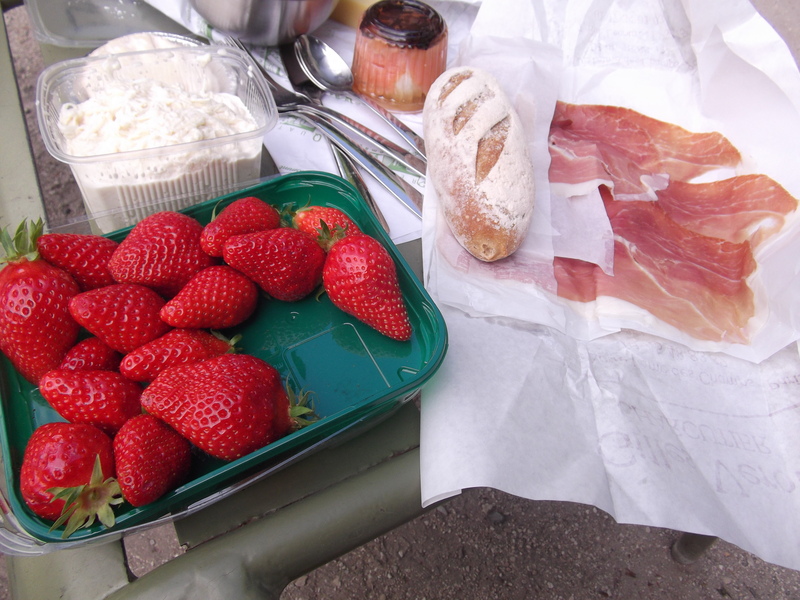 I swear I can taste the strawberries in Paris and now have an uncraveable hankering for them! Dang. I had a large amount of local strawberries to use up yesterday and I made a big old delicious tart, but wish I had first read this. Must buy pistachios. I too have never forgotten the food I ate on my first trip to Paris. I love the simplicity of this recipe and can’t wait to try it with the next case of strawberries. Mine have all been consumed or canned at the moment! This looks like the most delicious thing EVA.